New! Video Clips: Students Collaborative Presentations! The WYM is not merely an event. Nor is it an English presentation competition! English NEW!! Students Presentations Video Clips　!!! Participating Countries: Taiwan, Cambodia, Philippines, Malaysia, Korea, Indonesia. 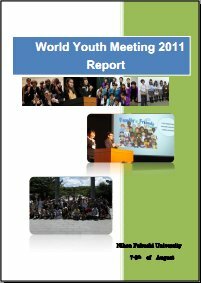 Copyright(C) 2016 World Youth Meeting All Rights Reserved.